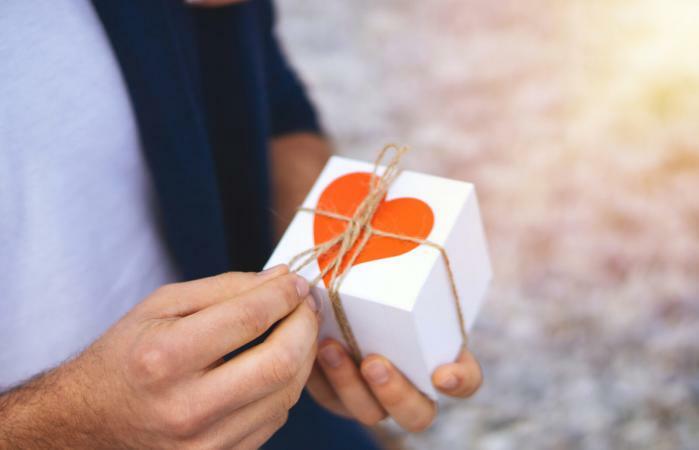 Gifts for the special guy in your life on Valentine's Day can range from romantic to fun and with a little thoughtfulness he'll love what you've given him. Steer clear of cliché guy gifts and consider your man's unique personality and interests to choose the best gift or experience for him. Guys can be just as sentimental as girls even if they aren't comfortable sharing their sweet side with everyone. You can appeal to his sensitive side with a thoughtful, traditional Valentine's Day gift. These romantic gift ideas for him have a classic feel but incorporate items or words unique to your relationship. Valentine's Day is all about celebrating love. Capture your feelings in traditional or creative love notes he can keep and read forever. Compile loving text messages, saved voicemail transcripts, or love letters you've sent each other into one scrapbook or journal. Give him a homemade book about your relationship that highlights milestones like the first time you saw each other, your first kiss, and a list of pet names for each other. Handwrite him a 100 Reasons Why I Love you poem and frame it. You really can't go wrong with giving your guy some of his favorite snacks or sweets. Since it's Valentine's Day, look for treats you can customize with labels that include love puns and plays on words. Wrap up his favorite foods and put your own words on the labels. For example, take a bottle of hot sauce and write on it, "You're hot stuff." or peanut butter and jelly with the saying, "We belong together like peanut butter and jelly." Fill the pantry with these items so when he opens it for a snack he'll get a loving surprise. Buy him custom candies that have his name, a picture of you together, or other unique words and images related to your relationship. You can customize your own pack of M & M's in nearly 20 colors by adding clip art, words, or images for around $35. Put together a snack bucket or basket with a theme such as "You Make Me Hot." Choose a unique container like a wide-mouth water bottle then fill it with spicy snacks and sauces. Any guy would melt with the gift of massage-especially when it's from his girlfriend. An at-home spa day gives your guy the chance to relax with you and without any concerns about being seen getting a pedicure. Buy massage oil and give him a massage. Light candles for him and create a romantic atmosphere. Set up a pedicure station in your bathroom. Push a chair up next to the tub and fill it with a relaxing foot soak then give him a little foot massage. Find a few bonding activities like staring deeply into each other's eyes for several seconds or playing a romantic game and print out directions for each. Set up a comfortable seating area and try out each activity. Your guy and your love is one-of-a-kind, so his Valentine's Day gift should be too. Homemade romantic gifts are great for Valentine's Day because they show your love through thought, time, and effort. Get creative and come up with a present no other guy will have. Find a map of your town, state, or country to start. Use a fine-tip red marker to mark points on the map that are important to your relationship such as where you met, where you got your first place together, where you took your first date, or where you became an official couple. In one corner make a key or legend that describes each point on the map then frame it. Use chalkboard paint to turn any flat item into a blackboard. Use a heart-shaped piece of wood or metal sign as your base for this DIY Valentine's Day gift for him. Once dry, write a couple love-related categories on the left side of the sign. For example, categories might be "Hugs," "Kisses," and "I Love You's." When you give him the gift, add a tally mark to each category after you hug him, kiss him, and say "I love you." He can continue the tally marks all year long to see how loved he really is. Create a small clothesline from string or yarn and hang it in his home office, over his nightstand in the bedroom, or in a main area like on the mantel. Gather 14 envelopes in Valentine's Day colors and hang each from the line with a clothespin. Inside the first 13 envelopes add passionate love letters or quick romantic activities. The last envelope should contain or lead to his Valentine's Day gift. Each day for the first two weeks of February your guy can open one envelope to celebrate the 14 Days of Love countdown to Valentine's Day. Valentine's Day doesn't have to be all about gifts, it can include fun outings and experiences where you make new memories together. Pack up a few essentials like snacks, water, a compass, and maybe even a small tent. Grab your guy and drive to an unfamiliar hiking spot. Together you'll need to head out on an adventure and make your way home, whenever you feel like going back. For safety purposes, make sure you let a friend or family member know where you're headed and a hard date when you'll return by. Turn a night or weekend at home into a romantic evening made for the two of you. Think about a trip you took together or one you'd like to take someday when you can afford it. Plan meals and activities at home that you might find on that dream trip so you don't need to leave for the entire staycation. Tell others you're leaving town and turn off your phones to be left totally alone. 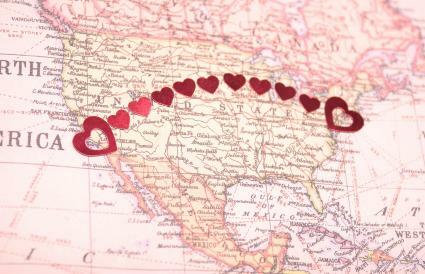 On Valentine's Day give your guy a homemade itinerary and even fake plane tickets to tell him all about your excursion. An easy and inexpensive way to learn something new together is to set up an apprenticeship for one day or longer. Look for a local artisan who creates something of interest to your man such as wood carvings or restoring antique cars. Call and ask if you could set up a one-day learning experience for your guy or for the two of you. If the artisan is amenable and offers a free experience, make sure you bring a donation or gift basket to say "Thanks." When it comes to getting Valentine's Day ideas for a boyfriend, giving him a creative gift or experience with make the day feel more special than any other. Show your guy some love by planning ahead and thinking of what would make him feel most loved.